Positive Cash Flow – Home Run – Investment Property! Price reduced to $64,900 and Seller is offering a $1,000 closing cost assist! 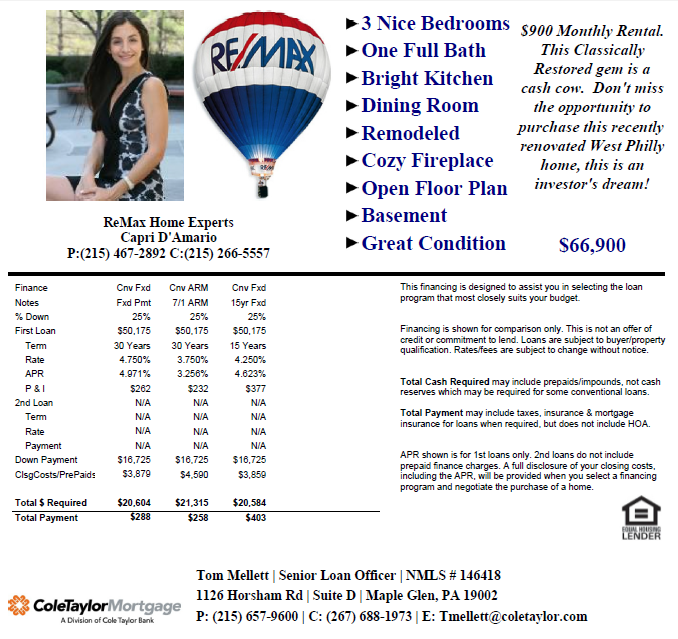 Posted in I Rent, I Want to Own and tagged Agent, cash flow, First Time, Home, Home Buyers, Home Experts, Home Inspection, Investment, mortgage, Philadelphia, RE/MAX, Real Estate, REALTOR, university city, West Philadlephia, West Philly. Bookmark the permalink. Thank you to all my clients, friends and allies who came out and celebrated Autumfest with me! And a BIG thanks to Scannicchio’s for hosting such a delicious event!! Getting Ready to Pick a Winner! Thank You Dr. Chris McKenzie for Contributing! Thank You Hot Hands Studio & Spa for this Fantastic Give-a-way! Thank You John Goldthorp for Joining the Allies!! Thank You Scannicchio’s! What a beautiful event! Bummed you missed this event? Be sure to subscribe to this blog to be the first to get an invite to the next one! Posted in Events, I Own, I Rent, I Want to Own and tagged ABR, Agent, ALHS, allies, Ally, First Time, Fix Your Run, Home, Home Buyers, Home Inspection, Homes, Insurance, John Goldthorp, Men's Stylist, mortgage, party, Personal Trainer, Philadelphia, Public Adjuster, RE/MAX, Real Estate, REALTOR, Resolve Adjustment, Scannicchio's. Bookmark the permalink.